iradiophilly | News - Muhammad Ali, The Greatest of All Time, has died at age 74. Muhammad Ali, The Greatest of All Time, has died at age 74. 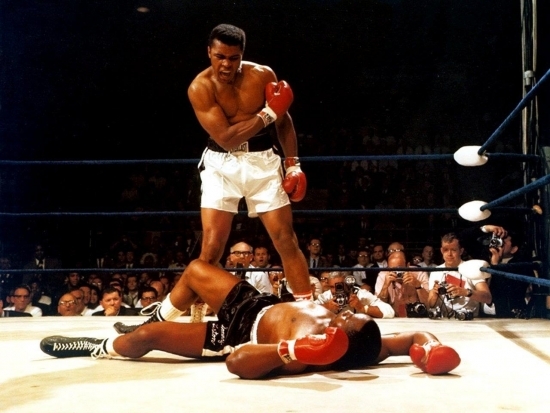 The Greatest of All Time has passed. Muhammad Ali has died at age 74 after a 32-year battle with Parkinson's disease. Ali was at a Phoenix-area hospital the past few days being treated for respiratory complications. Funeral services are being planned for his hometown of Louisville, Kentucky. Born Cassius Clay on Jan. 17, 1942 in Louisville, KY, he started boxing at the age of 12. Clay won six Kentucky Golden Gloves championships, two National Golden Gloves championships and two National Amateur Athletic Union titles. At the age of 18 he won a gold medal as a light heavyweight at the 1960 Olympics in Rome. He went professional soon after. Ali would go on to become a three-time World Heavyweight Champion, defending his title numerous times, and finishing his career with a record of 56-5. He was named the greatest athlete of the 20th century. Outside the ring Ali was even larger than life. His mouth was as quick as his feet, his banter and quotes as fast as his fists. "I done wrestled with an alligator, I done tussled with a whale, handcuffed lightning, thrown thunder in jail; only last week I murdered a rock, injured a stone, hospitalized a brick. I'm so mean I make medicine sick." He was also controversial. After his first title win over Sonny Liston in 1964 he announced he had joined the Nation of Islam and changed his name as part of his conversion. As a black athlete on the world stage, Ali fought for civil rights. In 1967, Ali refused to fight in Vietnam on religious grounds. He was denied the exception and charged with draft evasion, his title was stripped, and boxing license revoked. The conviction was overturned by the Supreme Court four years later and he was able to return to boxing. Ali retired from boxing in 1981 and was diagnosed with Parkinson's disease, a progressive neurological condition. He continued his activism, but focused on humanitarianism, promoting peace, and bringing the world together. His disease may have slowly taken away his motor skills and his ability to speak, but it did not stop the greatest from continuing to contribute to the world.